is a director, actor, and writer focused on female-driven stories that defy expectations of what female films should be—beautifully dirty, visceral tales that capture truth and inspire thought. We are thrilled to premiere her breathtaking short film, Biophilia, and share what we hope will be an inspiring conversation with the filmmaker. Keep up with Marina and her many projects @marina824 and at https://www.marinamichelson.com/. DS: Hello Marina! We are thrilled to have your short film, Biophilia, on Women and Film! Can you explain the film in your own words? MM: Biophilia is about a woman new to farming who is pushed to prove herself when an animal dies under her watch. The film explores themes of emotional abuse and trying to hack it in the wild. It asks questions about our relationship with nature and power. DS: What was the process of making this film like? Specifically, where was the film shot - the landscape is stunning and gives the film a very distinct feeling? MM: We filmed on this magnificent property called Rocky Ranch in West Marin County, about an hour north of San Francisco. It’s a 600 acre fairly remote ranch that’s halfway between Petaluma and Tomales Bay, about 45 minutes from the nearest services. The ranch belongs to the family of my dear friend James Thacher, whose grandfather, Jim Thacher (to whom the film is dedicated) purchased the property in the 1960s and it became his spiritual home. It’s a prized piece of land made up of wide open meadows and rolling hills, just beyond which lies the ocean. There’s this briny blanket of misty fog in the mornings that rolls back by midday so that the sun can shine its light across the entire region. It’s really something to marvel at. I will never forget the first time I saw this place. My best friend Meryl, who plays the lead character in the film, was married there several years ago and I was driving over a few days ahead of the wedding to help set up. I had just come off the drive from L.A. as the sun was setting, and I was driving down this idyllic country road called Chileno Valley that leads to the ranch, taking it all in - the magnificent oak trees that arced over the road creating a natural trellis, the expansive meadows, and quaint farmhouses in the distance. All of a sudden, I saw something strange at the side of the road... a figure, about two and a half feet tall, but I couldn’t quite register what it was. So I hit the brakes. Luckily, I had driven up with friends that could confirm I wasn’t just dreaming and that we all saw the same thing. It was a toddler-sized owl sitting at the side of the road. It took my breath away. It was frightening and... surreal. I drove the rest of the way in a daze. I quickly realized that I was in the most wild and magical place I had ever been to, almost as if I had stepped into Narnia, except it was really, really real. I knew that I wanted to share my experience of awe of this place. Making the film in this incredibly rugged terrain with limited resources and minimal connection to the outside world was an apt parallel to the film’s themes. The area is a dead zone for cell service, so we didn’t have any and the antennae we put up had limited capabilities, so we had to save internet access for emergencies. It was an incredibly rainy season and while the picture reaped the benefits of last year’s wet La Niña winter with all that green on screen, our crew had their work cut out for them. We hiked up steep hillsides to capture images of the sheep from afar, perpetually wrong in estimating where the sheep would be on their daily grazing routine. We had at least 5 cars get stuck in the mud, including our grip truck that was thankfully towed out by a neighboring ranchers. Our picture truck got stuck in a muddy ditch right before it was needed for a crucial shot where Rachel rigs the sheep up to the truck. It was challenging, but also thrilling and incredibly humbling. It felt impossible, but we did it. I have a beautiful memory of the night we wrapped, our crew of 25 huddled together under the stars in what felt like the middle of nowhere, sharing cold beers and warm cups of tomato soup, gleefully recounting how we’d tamed a bit of nature to make a movie. DS: The film features what I would classify as an abusive relationship, or at best a very unbalanced power dynamic. What was the inspiration to show this type of relationship - it feels very pertinent and timely in today’s climate. MM: This is an interesting question… Throughout the conception of this film, I was thinking about different experiences of power, specifically the notion of “empowerment” which has been a hot topic of discussion in our current cultural moment, and kept coming back to this image in my mind’s eye of a woman gripping a knife like she’s learned to use it in a new way. I was also considering how power is experienced interpersonally and in relation to nature, and how the imbalance of power manifests as abuse. This was all on my mind long before the doomsday election of our Gaslighter-in-Chief. When the public conversation began to point to how Donald Trump was gaslighting America (see Lauren Duca’s piece in Teen Vogue) with his perversions of truth and facts and “fake news” nonsense, the theme became all the more imperative to explore. Women are all too familiar with this kind of manipulative re-framing of reality and its intention to shut a woman up and make her doubt her perception. I wanted to explore how these tropes, like being deemed difficult or hysterical, too sensitive, or--every woman’s favorite--crazy, have been damaging to women. As a culture, we are are so entrenched in a culture of gaslighting, it’s like the air we breathe these days, so I was burning to watch a woman try to untangle that knot and undo the damage it’s wrought. Abusive relationships are more common than I think is publicly acknowledged and the question of why a woman, or any human for that matter, stays in a bad relationship was an intriguing starting place for me. On a similar, but different note - I recently finished reading this book called The Power by Naomi Alderman that is a page-turning explorating about tipping the balance of power between the sexes and it was THRILLING! I hear it’s being made into a T.V. series a la The Handmaid’s Tale and I cannot wait. DS: Who are some of your influences as filmmakers? Did any films directly inspire Biophilia? MM: I’ve always loved the way Terrence Malick explores nature in his films, with this sense of great reverence and fear. I love Days of Heaven, Badlands, The Thin Red Line, Tree of Life. I thought about and referenced images from all of those films during my process. I was also thinking a lot about Kelly Reichardt - the quietly charged and intimate way she explores relationships set against the nature world like in Old Joy, Wendy & Lucy, Meek’s Cutoff, even in Certain Women. 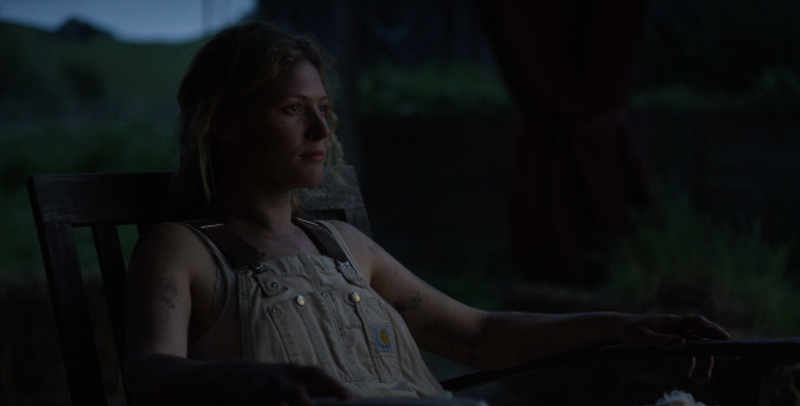 I was studying films where the natural environment plays a character, like how you get to know the surrounding landscape in Debra Granik’s Winter’s Bone, or the way internal & external landscapes are paralleled in Sean Durkin’s Martha Marcy May Marlene. With my DP Lowell Meyer, we also looked at images of Force Majeure as a visual reference to help us compose our framing of our characters within the landscape. DS: Can you walk us through what’s next for this film? I think many readers would love to know the distribution and promotion process for a short film. MM: We’ve had a fun run of film festival screenings across the country, starting with our premiere at the Brooklyn Film Festival this past June where we won an award for best screenplay. What’s next is sharing the film as widely as possible online. While there are opportunities out there for short film distribution, my goal is for the film to be easy to find by anyone interested in the narrative world In regards to how you promote a short film, I think it’s a combination of authentically sharing your story and finding different outlets to get the word out, but it’s also about getting all hands on deck. How else do you cut through the noise and endless content of the internet? You appeal to your allies and the rely on the power of word of mouth that happens when people connect to something and instinctively want to share it with others. That strikes me as a very naively idealistic answer, but I’m no expert in public relations! I stand by authenticity! DS: Has filmmaking always been a goal for you? What roles have you held in filmmaking and are there any roles you haven’t held yet but would like to try? MM: It took me a long time to realize I could be a filmmaker myself, that I could direct. It was something that was never really modeled to me. As a kid, when I corralled my friends to put up plays of our own, no one named what I was doing “directing”; they just called me bossy. While studying theater at NYU, I pursued a minor in cinema studies and embedded myself in my film friends’ student productions, trying to glean an education by association. I hid in the shadows of boyfriends who were directors, helping them cast, cater, edit, produce--whatever was needed to get the movie made, I filled in the cracks. In that way, I learned that there’s no way around it, you have to learn how to produce to get your work made, so I began producing some theater and short films, which then translated into producing my own work. It wasn’t until after college that I realized I wanted to make films myself. I had just wrapped filming for my first role in a feature, a Cassavetes-inspired indie romance called Should’ve Kissed, which was the brainchild of Korean auteur, Jinoh Park. From the get go, my creative participation was required as we improvised our way through the auditions and later mined my experiences for the script. Despite the miserable filming conditions-, outside during the freezing cold slush of New York City of February, I fell in love with the process and was crushed when production wrapped and I no longer actively involved in molding our story. I made my first short film shortly after. In regards to other roles, I want to keep writing and would love to be in a writer’s room. Spending so much time writing on my own has made me really curious about working collectively alongside a diverse group of minds. I really treasure the collaborative nature of filming, so that’s something that excites me. DS: You have also done your fair share of acting? What have you learned about directors as an actor, and what have you learned about actors as a director? How do you feel your experience of being in both positions has affected your craft? MM: Yeah, I was a very shy kid so my parents put me in acting school at Lee Strasberg in an effort to pry me open. I love acting and think of it as my first language of storytelling. Acting is an ongoing practice in stepping into someone else’s shoes and trying to advocate for their wants and intentions, which makes it a practice in empathy-building. I think it’s a beautiful gift to be be a vessel for a story. I’m in rehearsal for a new play that I’m acting in and it’s so refreshing to go to work using your entire body. I was quickly reminded of how really open and pliable and game you have to be as an actor. I’ve learned that acting and directing both require similarly intense, but different scopes of focus. The director and actor are like two in a tango. They are moving through the dance together, but one is leading. It’s a symbiotic relationship. But it’s incredibly challenging to act while also directing. It requires a unique ability to split focus while steering the ship with ease. It’s a skill that I haven’t quite figured out yet, but would like to improve. Ultimately, my experiences both acting and directing have only enriched my understanding of each role. But it’s incredibly challenging to act while also directing. It requires a unique ability to split focus while steering the ship with ease. It’s a skill that I haven’t quite figured out yet, but would like to improve. I’ve been eager to shadow some actor/director-hybrids to observe how they wear both these hats. DS: Have you experienced any setbacks as a woman writing and directing your own films? What has your experience as a woman filmmaker been? Have you seen these conditions improve as time goes on? MM: An irritating recurring experience I’ve had as a woman filmmaker is a certain condescending manner in which I’ve been spoken to on set, as if I wasn’t firmly in charge or didn’t know what I was doing. Curiously enough, this doesn’t occur exclusively with male crew. I’ve had women that I’ve hired come up to me on the first day, gushing about how thankful they were to be working with a female director, only to turn around the next day and undermine me with a public rebuke of my decision-making. I had a female script supervisor insist that I wasn’t following proper workflow protocol, despite my assurances, so she announced to the entire set that I’d better learn her way if I was ever going to get to direct a movie again. It was startling to be undercut by someone I perceived an ally, but I didn’t take it personally because I think it’s a broader cultural effect of not being on as many sets run by women. It’s a habit I hope will change with the increasing inclusion of women in the director’s chair. As to whether conditions for women filmmakers are improving, I definitely sense a growing consciousness about the lack of women in the director’s chair and in all types of power positions within the industry at large. There’s a big wave of women supporting other women in film that I’m proud to be a part of, in groups like the Eastside Women’s Film Club and online communities like this one, Women & Film and the Los Angeles Women’s Film Collective. But I really hope this feeling of forward energy is not just reverberating in my Northeast L.A. echo chamber, and that tangible change in industry-wide hiring practices is increasingly experienced. Something I wanted to bring back up is how powerful role models are. It’s so hard to believe what you cannot see, so modeling behavior possible opportunities to younger women is a critical way to shape a more equitable generation of future filmmakers. Amy Heckerling was that person for me. Clueless arguably changed my life and she was the first female writer/director I knew by name, which reframed my understanding of who made movies. There are so many filmmakers who I want to praise for their influence on me, though I may not be able to draw a clear connection between their work and Biophilia, so I just wanted to shout out the many other filmmakers, like So Yong Kim, Jane Campion, Sofia Coppola, Andrea Arnold, who have expanded my understanding of what it is to be a filmmaker. DS: Other than Biophilia, what projects are in the works or in completion? What’s next for you and what is your ultimate goal as a filmmaker? MM: At the moment, I’m seeking financing for a short horror film I wrote set in the wellness space, called The Female Diet. It’s a proof-of-concept for a feature I’m writing about a former dancer desperate to get her body back who gets caught up in a wellness scheme that might just be the death of her. My blood is boiling for this film - I’m really excited about exploring the weird world of wellness through the lens of satirical horror, so I hope the stars will align to allow me to make it. I also have a very fun and ambitious script for a narrative fashion short inspired by my mom called Anoushka. It’s a period piece about a bullied Jewish girl in 1970s Soviet Russia who seizes an opportunity to break out of her school uniform and make a dress of her own design. I truly admire how the fashion industry has provided a platform for young filmmakers and how the major houses like Prada, Armani, Gucci, etc are collaborating with storytellers. That’s something I would absolutely love to do. If there are any fashion film loving financiers out there, get at me! I’m also re-writing a pilot called The Young Yenta about a newly divorced 30-something navigating the modern digital dating scene who realizes that life’s purpose might be in matchmaking. I don’t like to keep my eggs in one basket. I always have a couple of projects in development. It’s like growing a garden. You don’t design it with only a single plant in mind. You go at it with optimism and intention, but with the awareness that not all the seeds you sow will sprout. Then you show up every day, tending to the garden with love and care until you have beautiful blooms. My ultimate goal as a filmmaker is to build a sustainable career in this line of work and to make a living by way of these creative pursuits. I have many stories I want to tell, so the goal is really to keep finding opportunities to tell them. DS: Any last thoughts on anything - Biophilia, film, gender parity, farming - anything at all before you go? MM: Women & Film is such a beautifully-curated community and I am so thrilled to be sharing my work here. I couldn’t ask for a better audience. I’m also very thankful to you, Daisy, for the opportunity to have this conversation with you here. It’s been really fulfilling.